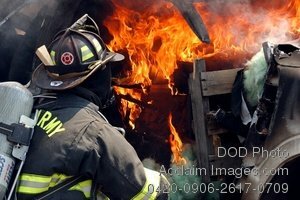 Description: Free, public domain image: U.S. Army Firefighter Controlling a Car Fire During Training in Honduras. U.S. Army Spc. David Grace, of the 287th Engineer Detachment, out of Danvers, Mass., controls a car fire during an exercise with the local fire department on Soto Cano Air Force Base, Honduras, May 1, 2008. The exercise is part of Beyond the Horizons, a joint training exercise between the United States and Honduras to foster goodwill and improve relations between the two nations. (U.S. Army photo by Sgt. Kathy J. Young.